Our goal is to create games simulating historical battles and campaigns over several centuries and across different continents. In order to achieve this ambitious undertaking, we have developed an exclusive rules system allowing us to simulate a great many number of different rules. Our game is based upon the best design practices of board wargaming but with a user-friendly interface, as expected by tablets users. We have worked with veteran wargamers in order to design our rules system and game engine. The game has been released on iPad but will be cross-platform. The Android Tablets, PC, Mac and Smartphones version will be released soon. By buying the Wars and Battles app you will be able to play the campaign in each of the 7 battles we will release in 2014 and 2015. 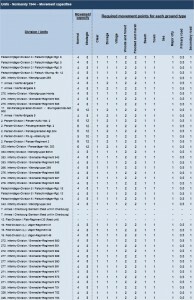 This represents more than 70 original scenarios in 7 different battles. If you like the Campaign, you can buy the Advanced and Battle Scenarios through in-app purchases. The production of these battles will keep us busy during the year 2015, but if you have ideas for future battles, please tell us about it on our forum. We are already thinking about a new set of 7 additional battles! 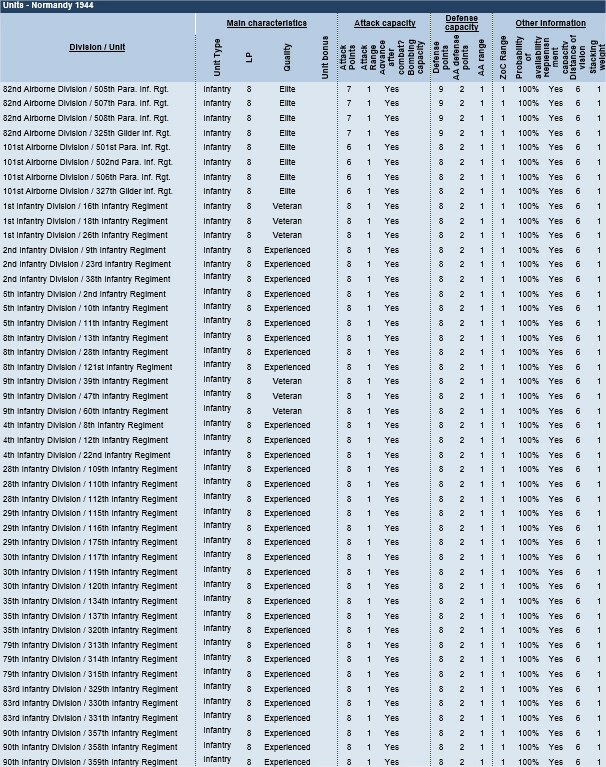 The artificial intelligence developed in Normandy 1944 currently corresponds to a beginner / intermediate player. It has a good tactical level but can be improved at operational and strategic level. Nevertheless, it already provides wargamers with a challenging experience on many scenarios! The team has worked continuously to improve the AI ​​in order to adapt it to future battles, but also to create an even deeper gaming experience in solo mode. On top of that, as part of the ongoing evolution of Wars and Battles in 2015, upgrading your rank will give you access to new features and new exclusive content! Four years after being expelled from Western Europe, two years after landing in North Africa and while the fighting rages in Italy and especially on the Eastern Front, the Allies land in Normandy on June 6th, 1944. Everyone knows that the Campaign will be crucial and that its outcome may occur quite fast. Marshal Rommel, who wanted the German troops deployed closer to the shores, has not been successful. Unlike most of his colleagues of the German High Command, he was able to measure the effects of the Allies’ air superiority when he fought in North Africa. In his opinion, deploying reinforcements too far from the coast is pointless: should the weather be too lenient, the sky will be full of Allied planes and the German army will be paralyzed. That’s what happens. And the German Troops must do everything they can, improvising and trying to stop the Allies’ steamroller. They actually do so by relying on Caen, taking advantage of the terrain including the bocage that slows down the Allied progression and striking when they can with their powerful Panzer Divisions. The Axis’ formations are more flexible than the Allies’ and the German Heavy Tanks Battalions are quite daunting, but it has far less supply than the opponent. Therefore, they must strike hard, and never hesitate to retreat to better regroup – despite the Führer’s hysterical exhortations not to give an inch! If, in June 1944, Great-Britain is in a much better state than in 1940, when it was standing alone against Germany being sole master on the European continent, four years of war have exhausted both its financial and human resources. On June 6 1944, the British deploy their last resources, which are almost non-existent. Still, their troops are highly experienced, their material is good and they can pull resources from the Commonwealth countries, including Canada. Excellent in defense, the British infantry is not as good in offensive strikes but the British armor’s quality is good, including the Sherman Firefly with the 17-pounder, which can pierce the armor of the biggest German Tanks. The great American war machine is turned on in late 1941, after the Japanese attack against Pearl Harbor. In 1944, it is in full swing and produces every month thousands of tanks and aircrafts. More than five million American soldiers are at boot camp in the United States. 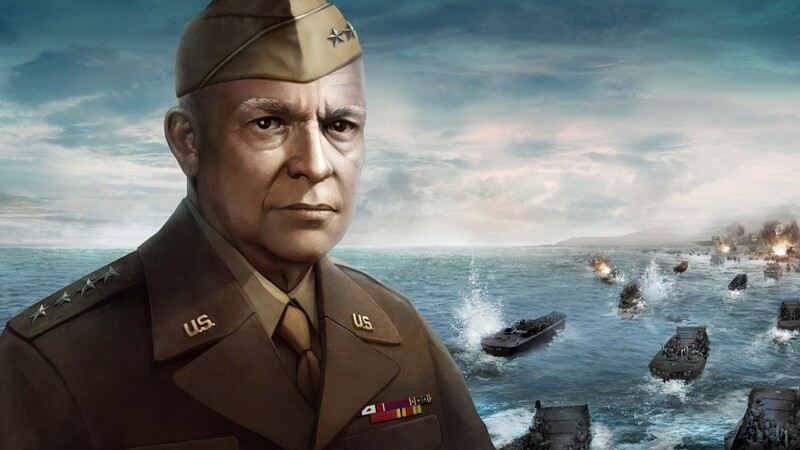 General Eisenhower is missing of neither material nor men, but the fighting in North Africa and Italy showed that the US military was inexperienced. In June 1944, it has learnt from its mistakes and can start making a par with the German Army. Many nationalities have been pulled in the Normandy turmoil, either in the German Army or the Allied Armies. Canadian Troops landed on Juno Beach June 6, 1944 and immediately distinguished by their courage in this difficult landing and then in the Battle of Caen facing powerful German Armored Divisions. 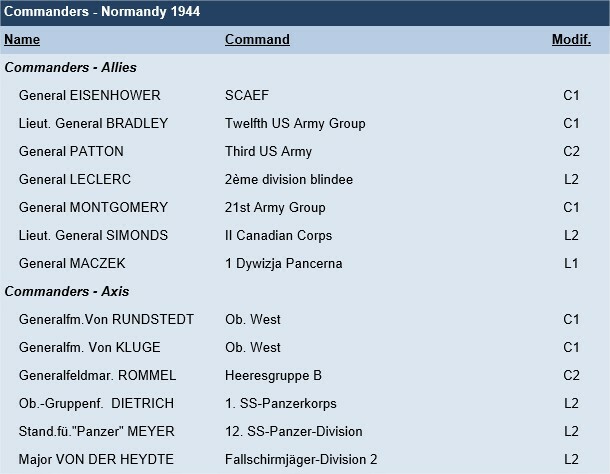 General Leclerc’s Free French are mostly grouped in the Second Armored Division, which is attached to the Third US Army under the command of General Patton. They are not involved in landing and arrive in France on 1 August. The 2nd Armored Division participated in the famous Cobra operation that allows US troops to break through the German front in the grove. The Free French then distinguish themselves by their strength through the release of Paris. The 1st Polish Division arrives in Normandy late July 1944. It is attached to the 2nd Canadian Corps. This Division’s glory lies in its decisive role during the fighting at the Falaise Pocket where it managed to junction with US troops from the South and to hold several days Mount Ormel against determined German Troops. Normandy 1944 is a historical strategy game that simulates the entire Battle of Normandy from 6 June to 25 August 1944, at an operative scale. 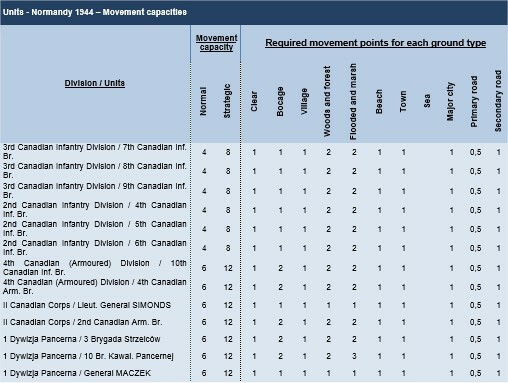 For this battle, the key design figures are shown in the following table. 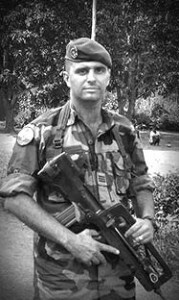 Officer in the French Army, having served in the Foreign Legion and the Cavalry, Commander Peretti has designed this game based on both his passion for wargames and his knowledge of history as well as his military experience. In addition to being a wargamer since the age of 16 and holding a History Masters from the Sorbonne, he has been an Officer for 18 years. 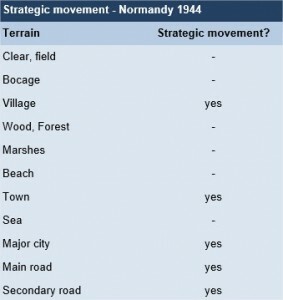 What he wanted to achieve in Normandy 1944 was the best balance between playability and historical realism. Based on the fundamental laws of war, such as freedom of action, economy of means and concentration of effort, Normandy 1944 should meet both novices and old veterans’ expectations. Mechanized: infantry units transported in semi-tracked armored vehicles. Combat Ratio: this ratio compares the attack value of attacking units to the defense value of defending units. The initial fraction is then rounded to the nearest to allow maximum simplification (1 in the numerator or the denominator). 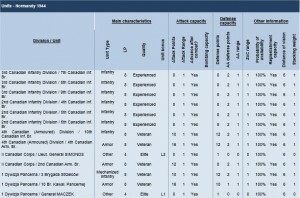 Each unit holds a specific quality (in descending order): Elite, Veteran, Experienced or Conscript. The quality of a unit determines its ability to absorb fatigue. And a better quality unit will exceed its fatigue threshold later. Each unit has Life Points (LP), representing its capacity at resisting to damage. A decrease in LF represents a loss of human resources or equipment. When the LP decrease, the State of the unit also decreases. When a unit has lost all its LP, it is destroyed. See units’ LP in §10.1. When a unit moves, fights or is bombed, it accumulates fatigue. Fatigue symbolizes both physical and moral strain. That is why this concept is sometimes used in battles of only a few hours. At the end of each turn, part of the fatigue is cleared out. In addition, a unit that is not activated during a turn sees its fatigue decrease by an extra factor. Depending on the quality of the unit, fatigue is more or less bearable. But beyond a certain level of fatigue, a status level is lost. The status of a unit is its ability to conduct combat. It comprehends both its life points and fatigue. The status has 4 levels. The higher the level, the higher its attack and defense capacities will be. 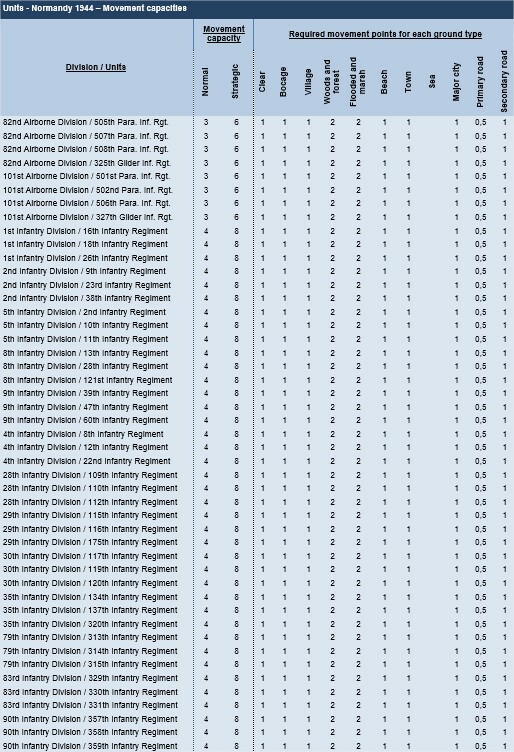 These are the values used to calculate the combat ratio between attacking units and defenders. 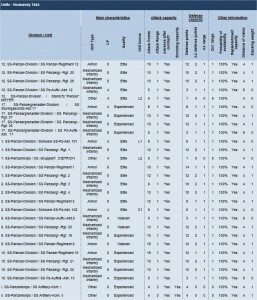 They depend on the unit’s quality and status. 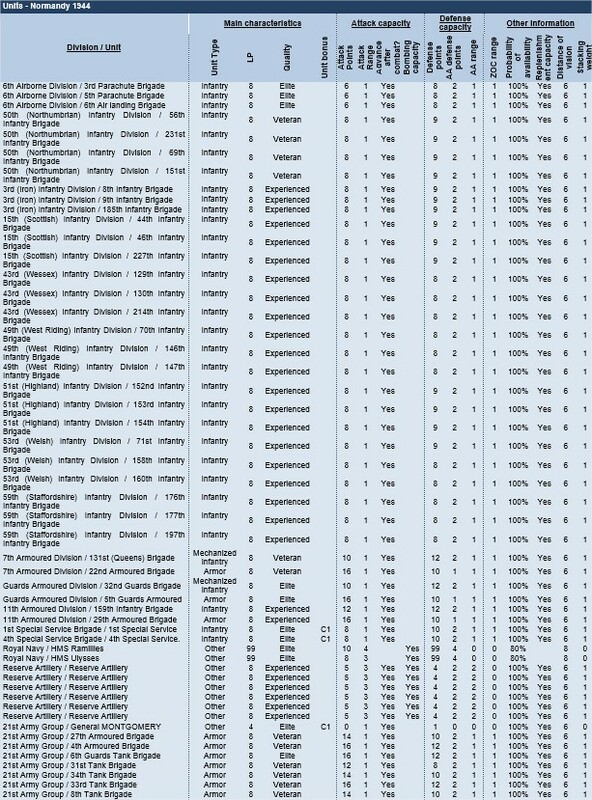 See attack and defense capacities in §10.1. Each unit has movement points (MP). Depending on terrain, the distance that a unit can travel changes: it is faster to move on a road than in rough terrain. Units usually can use a strategic move that allows them to travel twice the distance. Following such a move, they cannot fight. The weather can influence on a unit’s movement capacity (see §4.2.3). See movement capacity in §10.2. In Normandy 1944, units are either fully supplied or OOS (there is no intermediate level). A detailed order of battle is presented in §10. Almost all units presented in this order of battle are available for players in the full battle. 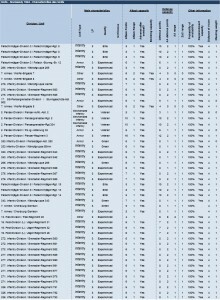 Some units, including Kampfgruppen, are used only for specific historical scenarios. In Normandy 1944, the destroyed units cannot recover and are taken out of the game, with the exception of air units. The latter recover two turns after their initial destruction. 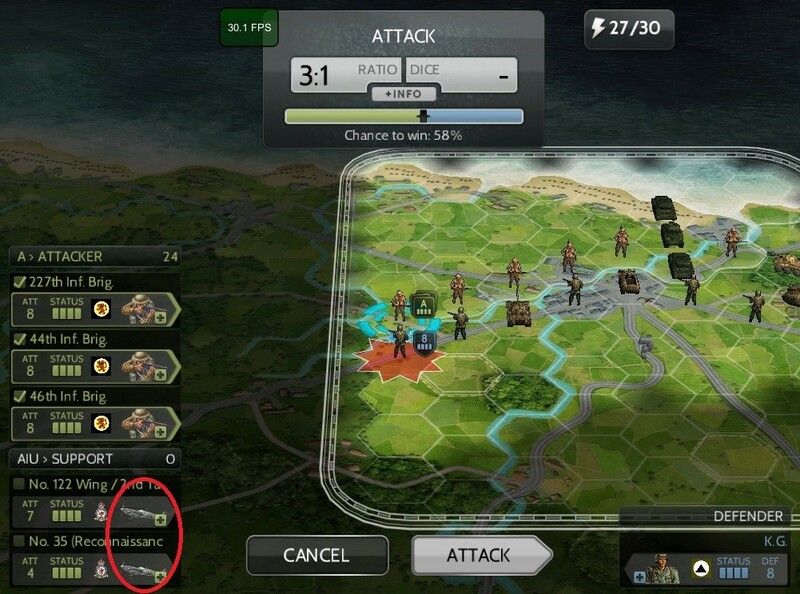 In Advanced and Battle scenarios, don’t forget to replenish your units regularly, either by removing them from the front on the Allied side or by allocating replenishment points on the German side, in order to avoid losing your units too quickly! The weather has a great influence on the conduct of operations. In general, the scenarios are based on historical weather, but in some scenarios, the weather can be determined randomly. The weather impacts air units. Overall, during sunny weather all air units can fly, and during storm all are grounded. 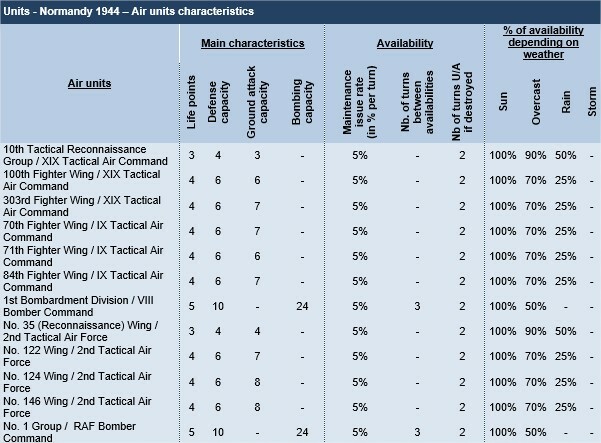 Regarding overcast or rainy weather, air unit’s capacity varies. 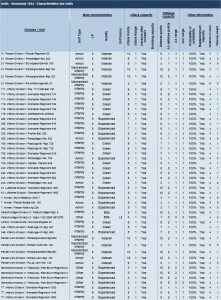 See the table details about air units in §10.3. In case of storm, Allied and Axis Armored units and Mechanized units of the Axis have their movement capacity reduced. 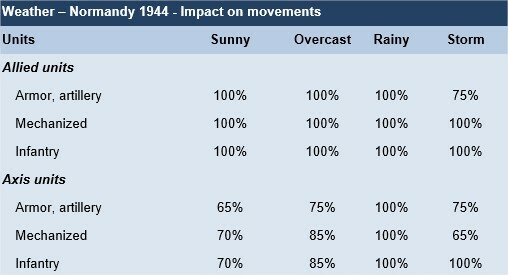 In case of sunny or overcast weather, German units have their movement capacity reduced to avoid Allied air strikes. 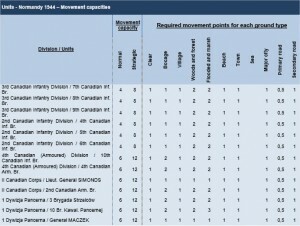 The table below shows units movement capacity as % of their normal capacity. The second player plays: first they may view the actions of the previous player (or of the AI in case of solo game) and then take their turn. When done, the turn is finished. For each scenario, activation points are given to each player. These points represent the player’s ability to command: the more points, the higher the player will be able to use their units. Each action performed on a unit (movement, combat or replenishment) requires an activation point. However, once activated, all other operations on the unit are possible without spending extra points. 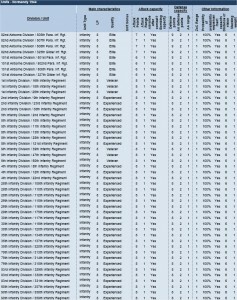 Activation points are automatically spent when an action is performed on a unit. However, if the number of activation point is insufficient, the desired action on the unit will be impossible. Beware of stacked units: If you select a stack comprising two units and one activation point is available, no action will be possible. You will need to ‘unfold’ the stack and select a unit to be able to take action. The number of points is the same at the beginning of each turn for a given camp. In case of multi impulses scenarios, the amount of activation points is the same at the beginning of each impulse. 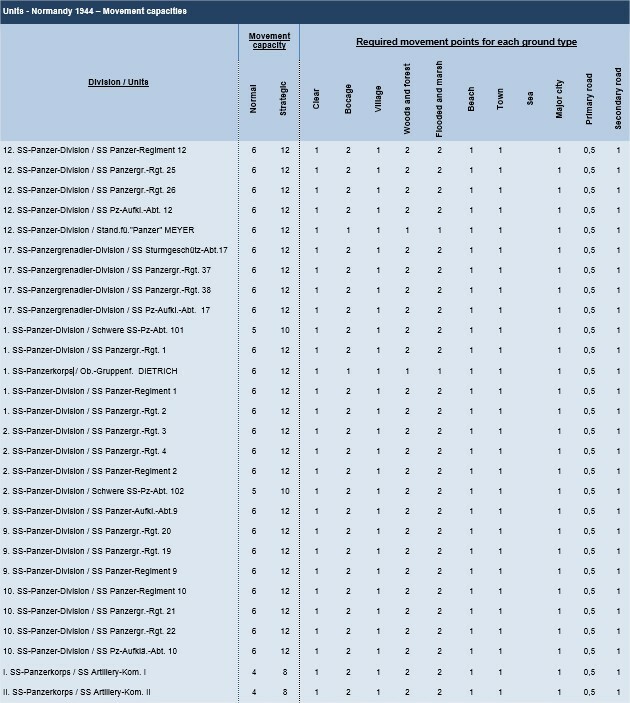 The defending player does not spend activation points. In general, in simple scenarios, the number of activation points does not affect your ability to move all your units. Conversely, in complex scenarios, the number of activation points is limited. In Normandy 1944, enemy units are visible only if they are within the player’s units’ line of sight. Each unit has a capacity to detect enemy units. The ‘View Distance’, namely the number of hexes on which a unit can ‘see’ their enemies, is specified in §10.1.2. Unit located within one third of the view distance (i.e. up to 2 hexes if the view distance is 6, and in clear weather) → unit identified, i.e. all its characterisitcs are visible. Unit located between one third and two third of the view distance → unit recognized, i.e. you know the type of unit but do not know its defense capacity nor its detailed characteristics. Unit located further than two third of the view distance → detected unit. An enemy unit we know exists and is represented by a “?”, and which type is unknown. A unit cannot enter a hex occupied by an enemy unit. A unit can move into or through a hex containing other friendly units. However, if such a hex reached the stacking limit, it cannot be crossed. When selecting a unit all available moves are displayed. 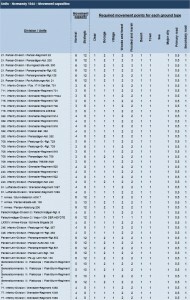 When choosing a particular destination hex, the fastest way to do that is automatically calculated (i.e. the least number of traveling points). 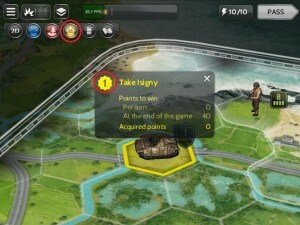 A player can move their units individually or in stack. The units moved in stack must begin their movement in the same hex. When moving a stack, it is the unit for which the movement is the most expensive, hex-wise, which is taken into account for the calculation of movement points. Movement is affected by terrain. The number of points spent to enter a hex depends on its type of terrain and the land between two hexes. 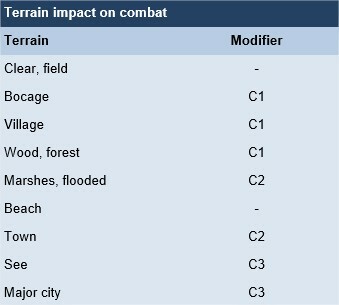 The different costs depending on terrain are shown in Table Terrain Effects, see section 10.2. A unit following a road may use the reduced cost of road movement. Where a road crosses a river, it is assumed there is a bridge. When a road enters a town hex, it is assumed that the units use the cost of road movement. Movement points cannot be set aside from one turn to another. They cannot be transferred from one unit to another. Strategic movement is faster than normal movement. However, following a strategic move, a unit cannot attack. Strategic movement of a unit is visible because the arrival hexagons are surrounded by dotted lines. Any unit can perform a strategic move if able to perform this type of movement (see in §10.2), and if the weather allows it. The weather can slow the movement, particularly in case of storm, and the weather especially affects the presence of Allied aircraft in the sky. In Normandy 1944, on clear days, the Axis units move slower because they must avoid crossing the path of Allied aircraft on patrol. The cost for crossing a stream (river or stream) is canceled by the presence of a bridge drawn on the map (crossed by a road / rail). A thin green line shows the hexes you control. Controlling hexes is important because the supply can only be brought to these hexes. Moreover, if an enemy comes into hexes you control, it is immediately spotted even if you have no nearby units. Land combat between adjoining units. Bombing from afar performed by the artillery, ships or heavy bombers. During this phase, friendly units can fight enemy units, which are adjacent to them. In Normandy 1944, a player is never compelled to attack. Units can make only one attack per turn. The fights are executed in the order chosen by the attacking player. Only one enemy hex can be attacked at a time. It is always the entire enemy stack which is attacked. Enemy units are forced to defend themselves if attacked: they cannot retreat voluntarily. The enemy units adjacent to the attacked unit cannot take part in the fighting, except with respect to air defense. All units of the attacking stack and all friendly ground units that are adjacent to the enemy unit and are available to fight are automatically selected. However, you may decide to unselect or not to fight. The units available to support the ground attack (land or naval artillery, aircrafts) are also presented but are not automatically selected. You can select up to 3 support units in each fight. Units stacked in the same hex may attack different adjacent hexes in 2 different combat phases. A hex can only be attacked once per turn, but can be bombed several times. During step 2, the combat ratio is calculated comparing the total attack value of attacking units with the total defense value of defending units. To determine the combat ratio, total attack value is divided by total defense value. This result establishes a balance of power, in the form of a fraction (4:1, 2:1…). The initial fraction is then rounded to the nearest to allow maximum simplification (1 in the numerator or the denominator). The resulting ratio is then the subject of many modifiers detailed below. Each combat result depends on combat ratio (after modifiers) and a dice roll (after modifiers). Based on this power struggle and dice roll (2D6), combat is resolved using the Combat Table. 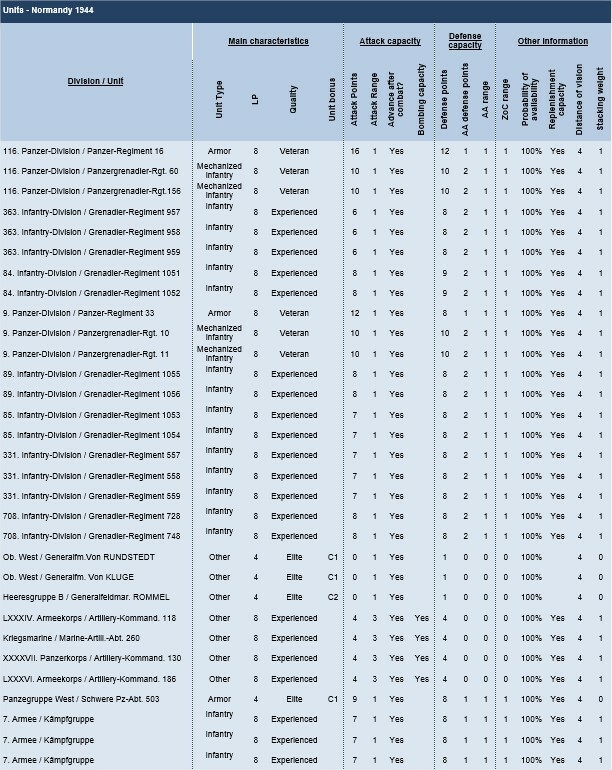 The results of this table are expressed in terms of loss of life points (LP). 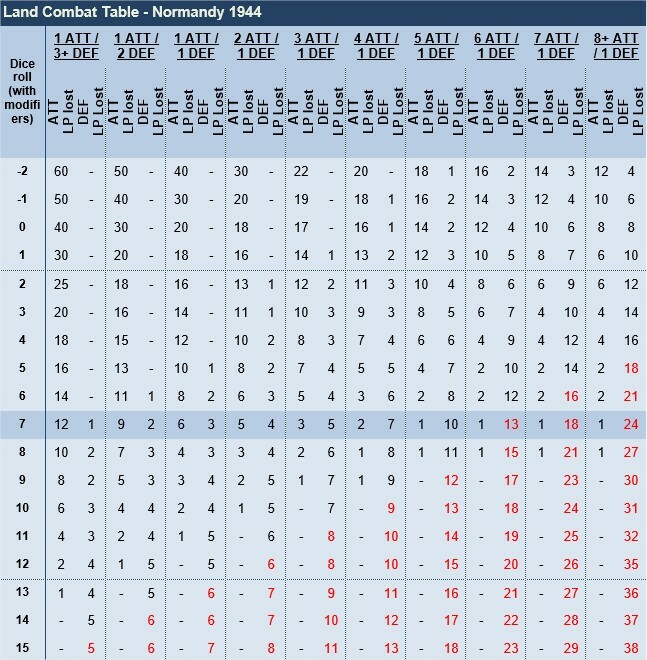 In the table above, the red figures mean that the defender retreats one hex in addition to the loss of life points. Example: the attacker has a combat ratio of 6 against 1 and rolls a 5 with a dice modifier + 2 = 7 for dice. The attacker loses 1 LP, the defender 13 LP and the defender retreats one hex. The LP losses are distributed alternately on the most powerful units and by chance. In the most advantageous cases for the attacker, defending units must retreat after a fight. Retreat is performed in the opposite direction to that of the main attacker, unless this hex is fully stacked or occupied by the enemy. Retreat takes stacking into account: if 3 stacked units must retreat on a hex where 2 units are already stacked, only one unit can retreat in that direction and the other two will have to take a different path. Thus, the retreating units can take different escape routes. If the unit must retreat into an enemy ZoC, it loses additional LP. If a unit cannot retreat because it is surrounded or is no longer able to retreat, as friendly stacks are full, it surrenders. After the opponent’s retreat, some or all the units of the attacking stack can decide to advance after combat on the vacated hex. 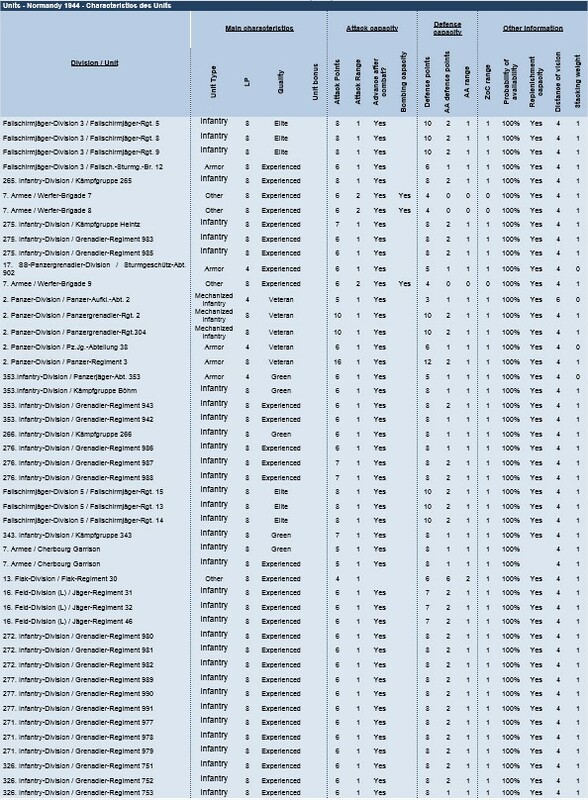 All modifiers are cumulative without limitation. When all units of the same division are involved in a single combat, the attacker (or defender) receives a +1 bonus ratio. When tanks and infantry units are stacked, the attacker (or defender) receives a +1 bonus ratio. The type of terrain influences combat for the defender (but roads have no influence on combat). C1 means a shift of one column in Combat Table impacting the combat ratio. In other words, a defender located in marshes benefits from a + 2 modifying the combat ratio (or C2), i.e. if the initial ratio was 5 against 1 in favor of the attacker, it will ultimately be 3 against 1, to reflect the difficulty of launching an attack in a flooded area. 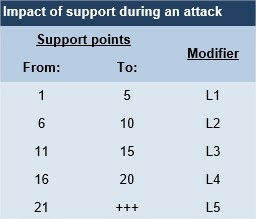 For example, if 15 points are supporting a ground attack, the attacker will benefit from a L3 bonus representing +3 at dice roll. 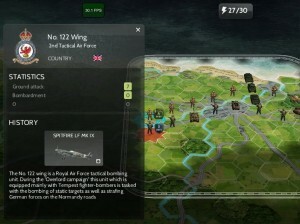 Regarding air support, attacking aircrafts may be forced to give up the fight, or can be destroyed by enemy anti-aircraft units and therefore the dice bonus originally planned can be changed depending on the progress of the air attack. Defenders cannot benefit from any support. If the German player attacks with a Tiger unit, he benefits from +1 combat modifier to his advantage regardless of the weather, terrain or the enemy. The area of Cherbourg being fortified, the Allies player attacking in this area suffers from -1 modifier. Besides Cherbourg being a major city, the modifier for attacking Cherbourg is C3 or -3. For example, if the attacker realizes a bombing with 15 points and rolls 7, the defending stack will lose 4 LP. 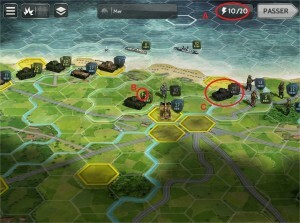 In Normandy 1944, land or naval units attacking through bombardment cannot lose LP. However, heavy bombers may lose LP. Moreover, as for the fighters-bombers, the mission of heavy bombers may be canceled if the Anti-aircraft (AA) is efficient. 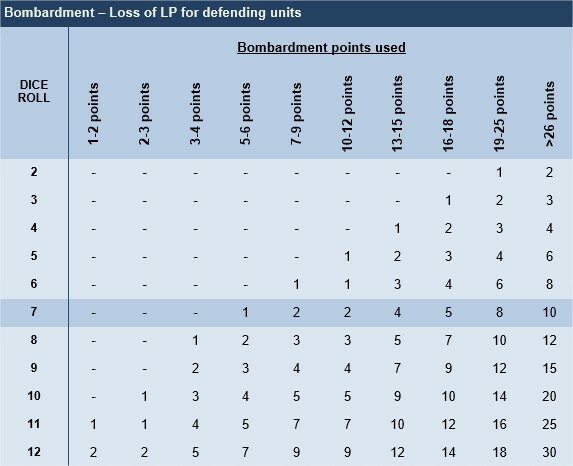 Bombardment points are fully effective on identified units, but if the units are simply recognized the points will be reduced by 25% and if the units are only detected by 50%. The Axis units have anti-aircraft capacity, which has a specific scope. These characteristics are specified in the table in § 10.1. A unit with a 0 AA scope can use AA capacity for its own hex. A unit with a 1 AA scope can also protect adjacent hexes. 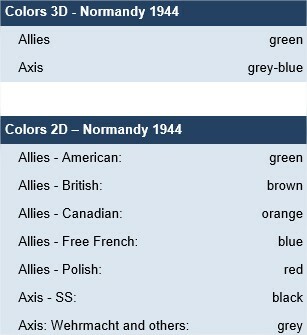 The use of AA capacity in Normandy in 1944 is the only case where friendly units can bring help to the units in defense. Units cannot enter hexes containing enemy units. A hex can contain up to 3 units. 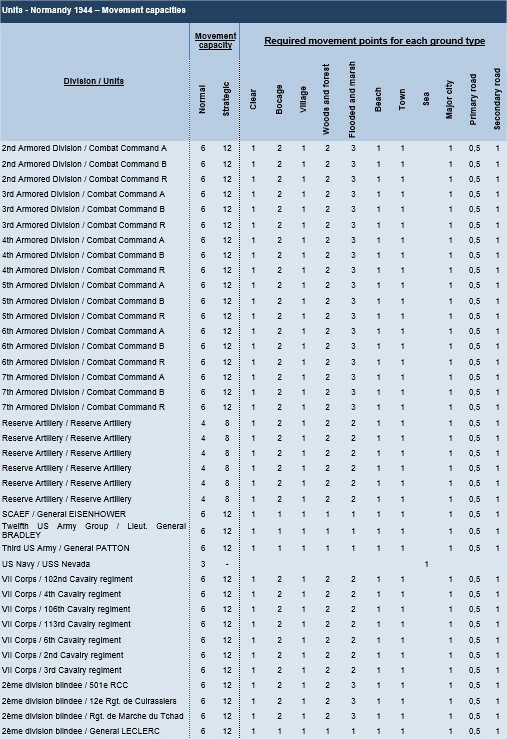 However, some units can freely stack (above the 3 units limit): Commanders (Allied and Axis) and the German units which size is smaller than a battalion. When a hex is full, it cannot be crossed by other units and must therefore be circumvented. The six hexes adjacent to a unit on the map are called Zone of Control or ZoC. The ZoC extends across all hexes except through the sea. The scope of the ZoC is 1 hex. 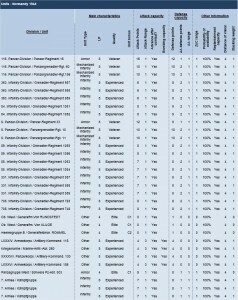 All units have ZoC except commanders and OOS units. A unit that enters an enemy ZoC immediately stops moving regardless of the number of movement points left. Besides, when a unit moves within the enemy ZoC, it can only move one hex. When retreating in a hex controlled by the enemy, the units lose some LP. A supply line cannot pass through a ZoC unless the hex through which passes the line is occupied by a friendly unit (see § 8.5). Reinforcements can arrive at any time in each scenario. In Normandy 1944, the reinforcements frequency is high as the Allies landed new troops on the beaches all the time, and Axis reinforcements were coming to stop them. 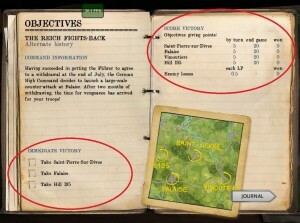 In Normandy 1944, reinforcements’ arrival time and location are set up from the start in the game design, and therefore cannot be chosen by the player. In some scenarios, the Allied units can recover automatically. This automatic replenishment is displayed in the journal. Units must not be in contact with enemy units. Therefore, they must withdraw from the front to be replenished. Units must have lost at least 25% of their LP. If a unit had 8 LP and lost only 1 LP, it does not reach the 25% threshold and is not replenished. Replenishment can increase LP up to 20% (of units’ maximum LP) per turn. A unit of 8 LP maximum that lost 5 LP can be replenished up to 8*20% = 1,6 LP, rounded to the nearest = 2 LP. Axis units can also be replenished in some scenarios. When replenishment is available for Axis units, it is also available for Allied units. Axis units’ replenishment is done manually according to the amount of replenishment points available for each turn. A unit cannot be replenished after attacking, remember to do it before! Replenishment can be performed even in contact with the enemy, and all LP can be recovered. This rule aims to highlight the flexibility of the German Army famous ‘Kampfgruppen’. Unused replenishment points are lost at the end of the turn. In Normandy 1944, the concept of fatigue corresponds both to physical and moral strain. The units get tired when they fight or move, and recover a little each turn. Energy is the opposite of fatigue: a 10% exhausted unit has 90% energy. Unit not activated during a turn: 20% more energy. A unit can only be supplied if it is linked to a warehouse through a supply line. A Supply Line is a continuous path of hexes from a unit to a supply source or warehouse. This line cannot cross an enemy unit or a hex adjacent to an enemy unit unless a friendly unit occupies it. The supply lines can only go through controlled areas. Supply distances are not taken into account in Normandy 1944. The consequence is that a unit OOS is no longer a threat to the attacking units… so long as it does not return to a supplied area! 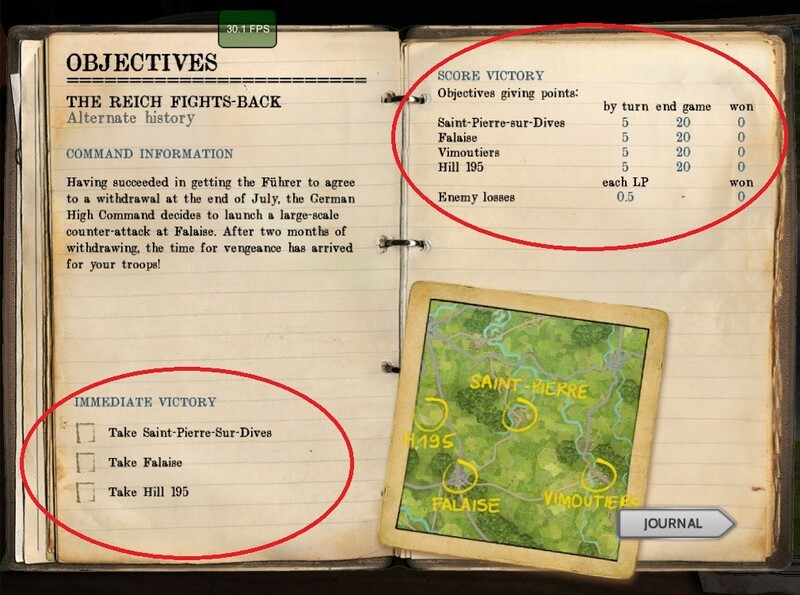 The victory conditions are displayed in the briefing at the beginning of each scenario. This briefing is accessible when the journal is displayed at the end of each turn, and throughout the game if you tap the journal on the table. One possibility to return to the journal is also to choose this option in the preference menu. 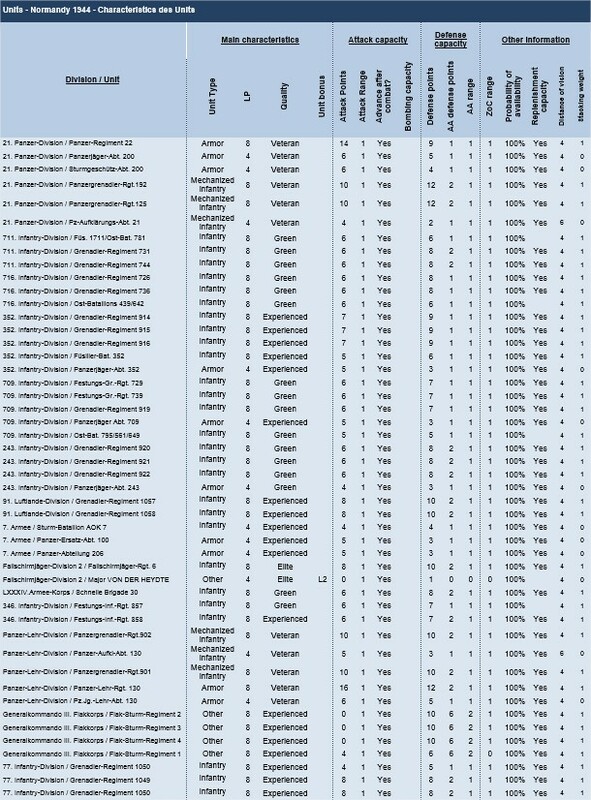 Also at the end of each scenario, a summary table displays the situation in terms of victory points. The number “1” circled in red means that the goal is a primary objective. The little curves around the circle mean that this objective (alone or in combination with others) provides an immediate victory when occupied. Additional information is provided on these objectives (points to be earned per turn and at the end of the scenario, points already earned). It is important to read the briefing in order to understand the objectives: scenarios may seem difficult when one does not take into account the objectives that yield the most points. If at the end of the scenario, your victory points are significantly lower than those of the enemy, you will suffer a defeat. Otherwise, it will be a draw. Marginal Victory is victory by a small gap. The enemy has been defeated but his troops can still fight. Tactical Victory: the enemy is defeated and the situation at the end of the battle puts the winner in a good position for further operations. Decisive Victory: you have reached your goals and put the enemy to flight. 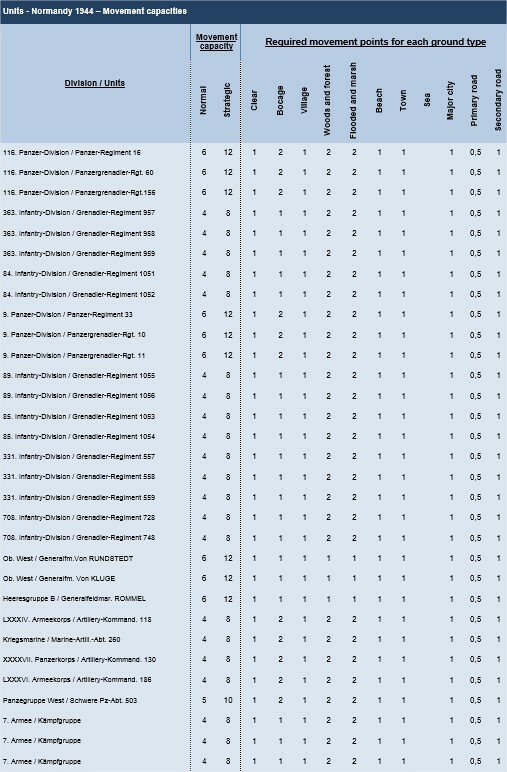 For each scenario, the number of victory points to earn varies. 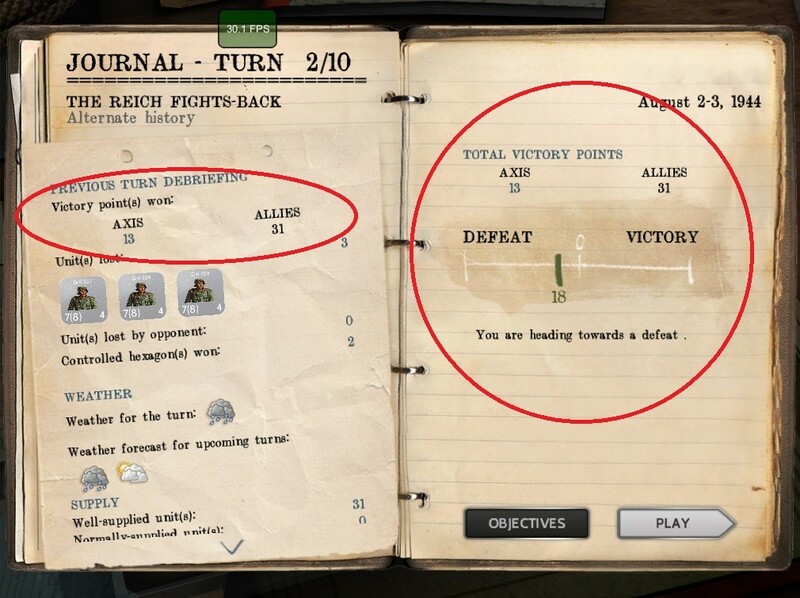 The journal displays the number of additional points required for a higher level of victory. In scenarios where earning points is mainly related to the occupation of objectives throughout the scenario, the player occupying them at the beginning may have the feeling he is winning. In Normandy 1944, as in reality, the course of the war often changes in a short period of time, and after a fierce resistance, enemy defense often tends to collapse, so do not be surprised if your opponent wins at the very end of the scenario. Victory Points in the Battle scenarios have been set to get a draw. 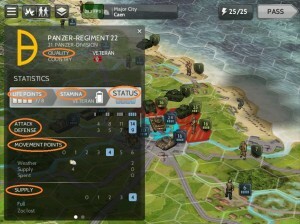 In other words, if you can save time compared to the Allies you will win the battle, but if you take too much time in getting the objectives, the Axis will win (and vice versa). Moreover, insofar as the victory points in the Battle scenarios are highly related to the occupation of objectives, it is logical that the German Troops are winning at the beginning. Each unit type has its own characteristics that give them different capacities and modifiers. 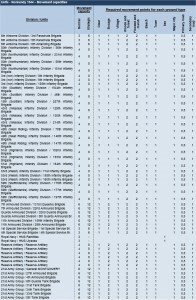 Life points: Regiments and Brigade generally have 8 LP and the smaller units have 4. Quality: the higher the quality, the more a unit will maintain its attack and defense capacity despite its fatigue and loss of LP. Unit bonus: some units benefit from an attack and defense bonus. These are Commanders and Tiger Tanks. C1 means +1 on ratio and L1 means +1 on dice. 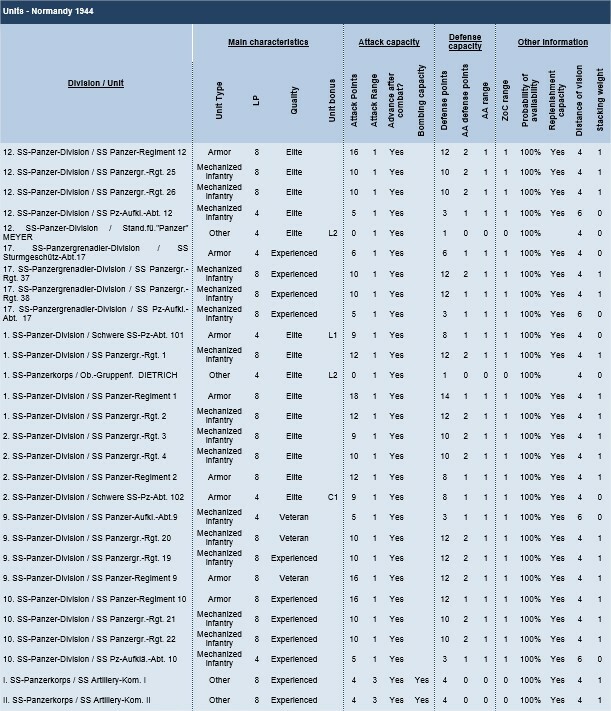 Attack points: maximum attack points of a unit. They vary depending on the status of the unit. 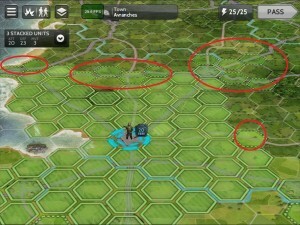 Range: units have 1 hex of range, expect for Artillery, which can bomb at 3 hexes. Advance after combat: all units can advance after combat. 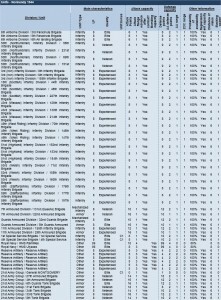 Bombardment capacity: Artillery and Ships have bombardment capacity. 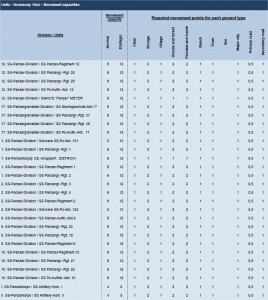 Defense points: maximum defense points of a unit. They vary depending on the status of the unit. AA defense points: Anti-Aircraft defense points. For Allies these points are theoretical because Axis doesn’t have aircrafts. 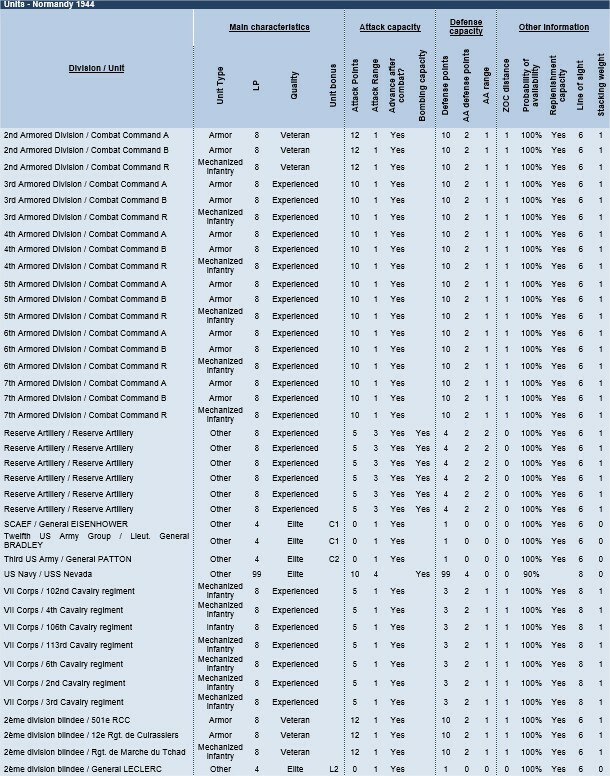 AA range: Anti-Aircraft range of units. ZoC range: range of the Zone of Control of a unit. In Normandy 1944, all units have a range of 1 hexagon but some units (like commanders) don’t have any ZOC. 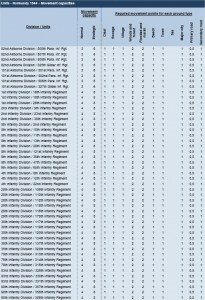 Probability of availability: Ships are not available every turn. Replenishment capacity: most units can be replenished (auto or manual). Line of sight: view distance of a unit. In Normandy 1944, that distance is also influenced by the terrain between the 2 units and by the terrain type of the observed unit. 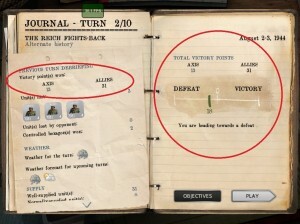 Stacking weight: each unit is worth 1 stack point, except Commanders and German units of a size less than the battalion whose stacking weight is 0, so it is possible to add them in a stack in addition to 3 other units which gives a slight advantage to the German player if he knows how to use this rule. Reconnaissance and ground attack squadrons: they bring support to land forces during combat. Attack aircrafts are more powerful, but reconnaissance aircrafts are available during bad weather most of the time. Bomber squadrons: they can only bombard units. They are very effective, in particular when combined with artillery to reduce Axis forces before an attack. 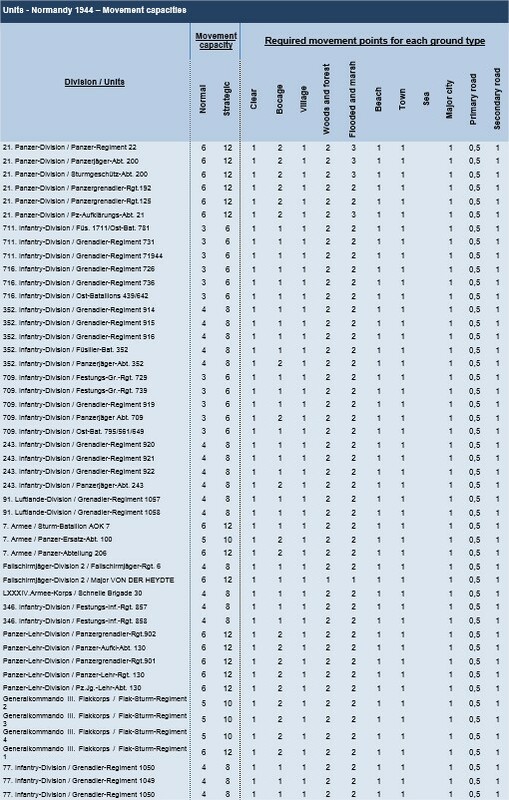 Life points: number of life points of the unit. 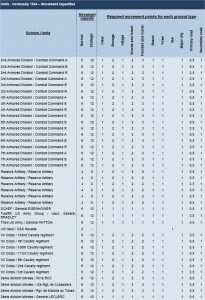 In Normandy 1944, only units with antiaircraft (AA) capacity can damage air units. Defense capacity against AA attack. 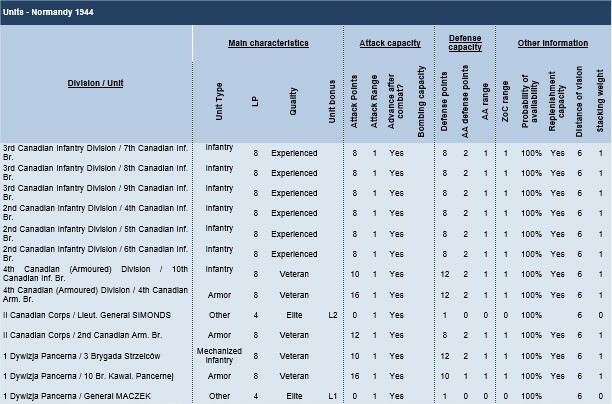 Ground attack capacity: used in the support combat table. 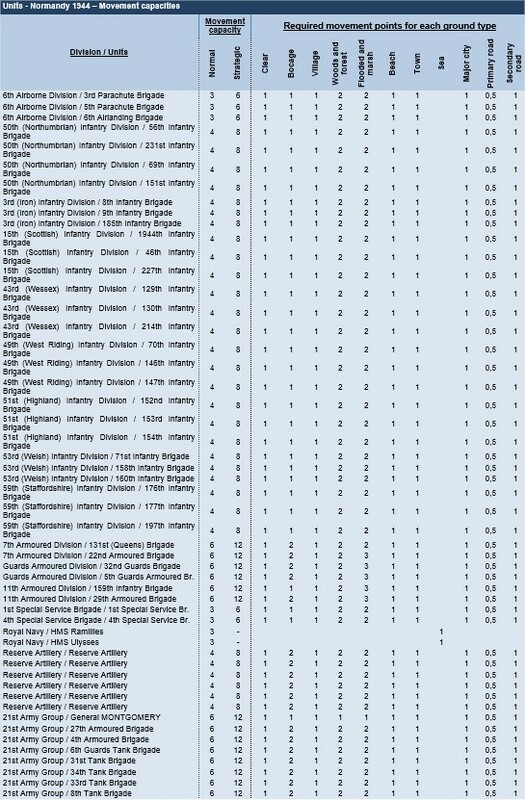 Bombing capacity: used in the bombardment table. Maintenance issue rate: each turn, an air unit can be unavailable because of a maintenance issue. 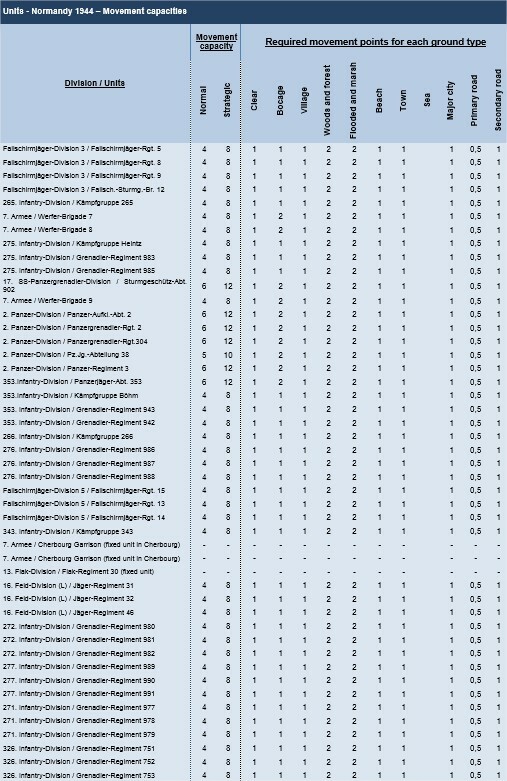 Number of turns between availabilities: heavy bomber units are not available each turn and have to wait three turns before becoming available again, if the weather allows it. 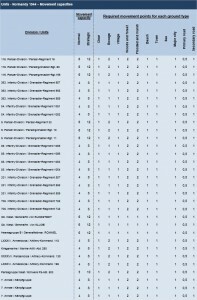 Number of turns between availabilities after unit destruction: when a unit does not have any life point left, it is destroyed and becomes unavailable for several turns. 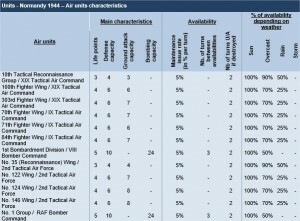 Percentage of availability depending on weather: depending on weather, air units are available or not: bad weather reduces significantly the availability of Allied air units. 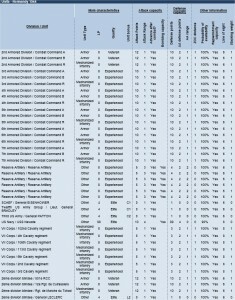 Note that as part of the campaign, there are 10 scenarios for Allies and 10 for Axis, but among those 10 scenarios, 2 are the same in each, so the campaign includes 18 different scenarios. The scenarios of the campaign must be completed one by one. Their aim is to make the player discover events of the Battle of Normandy, and the last scenarios offer a real challenge. The progress in the Axis campaign is distinct from that of the Allied campaign. Most advanced scenarios are historical scenarios. 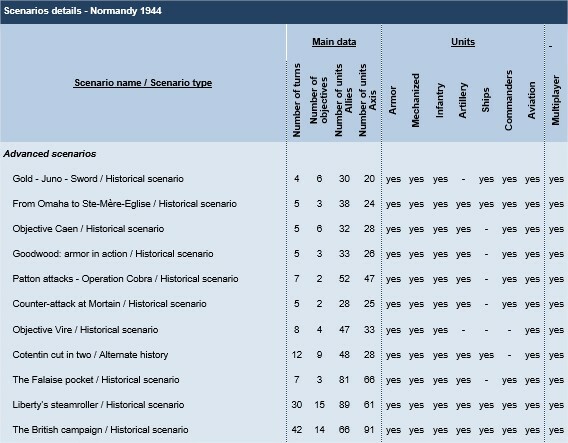 They offer the player the challenge to replay the main events of the Campaign of Normandy. Some of these scenarios are excellent for a game in multiplayer. In the historical battle, the victory conditions are set to reach a draw after 42 turns if the Allied troops follow exactly the historical progression (the player must be faster than in history). 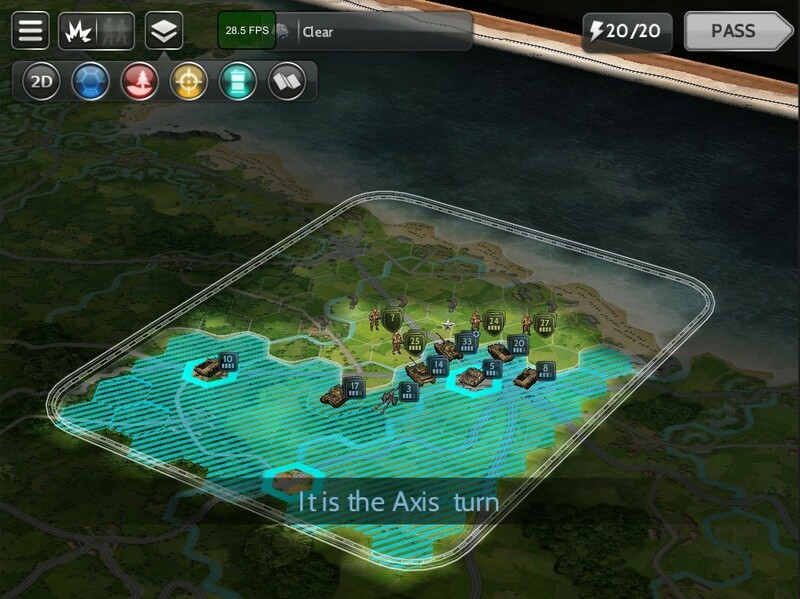 On the Axis side, in this plausible scenario, will the player be able reject the Allies to the sea?